On the 29th of June, Matthew Macklin will be handed his third attempt at the professional fighter’s ultimate prize in challenging WBA middleweight champion Gennady Golovkin. Although there are considerably more avenues to take than days gone by, even consideration for a shot at a World Title lets you know you’re on the right path. Macklin has the experience of the big occasion, few come bigger than the opportunity for an ‘Irishman’ to face lb for lb great Sergio Martinez on St Patricks day at Madison Square Garden. A fight Macklin lost, but maintained stock after a good showing even forcing the champion to touch down in the 8th round. Preceding the Martinez fight, Macklin dropped a hugely controversial decision to hometown champion Felix Sturm. A faded Sturm, a solid champion in his own right seemed a little gun shy and overwhelmed by the pace set by Macklin. Although he came on strong late on, I scored the fight in Macklin’s favour as did the majority of media members at ringside. Macklin’ had every right to feel aggrieved and who knows? Maybe third time will be a ‘charm’ for the ‘Irishman’. In Gennady Golovkin, we have a stand-out Amateur and former Olympic medallist who’s carried across crunching power into his professional career. Since winning an Interim version of the WBA World Title in Panama City Golovkin’s been on a tear, with eight straight KO’s in World Title bouts. Its ridiculous how understated his power appears sometimes, not least so in the CRUSHING knockout of Ishida in Monte Carlo three months back. If you’ve never watched Golovkin previously, YouTube the Ishida finish witnessing a prime example of what he’s capable of. Although Golovkin’s power receives all the accolades, his tremendous skillset and amateur experience is the foundation that allows the power to flourish. Now with Macklin, Golovkin’s opponents and defence’s will begin to reach a slightly higher level. Partly because he’s been avoided and partly because he’s been built up outside the U.S. his level of opponent to date hasn’t been what it could’ve. Macklin’s credentials are arguably the best he’s faced to date. Stylistically I believe the two fighters will mesh nicely. Unfortunately for Macklin, I believe he will play right into Golovkin’s hands. Both fighters like to stay on the front foot, control the centre of the ring. Macklin’ may have a little success early, out working Golovkin for 3 or 4 rounds maximum. But as soon as Golovkin lands that first telling shot momentum will DRASTICALLY. I fully expect the first clean shot’s Golovkin lands to be set the tone of the rest of the fight. As I said, I’m sure he’ll take his fair share early but I don’t believe Macklin’ packs enough behind his combinations for it to deter him. For however long it lasts, it’ll be entertaining; a fight well worth tuning in for. Both men love to trade and with Golovkin we have a fighter who can end it instantly. I fully expect Golovkin to end this inside the distance, anytime between the 5th and 8th, there’s a reason Macklin walks into this a +600 underdog. Not only do I believe Golovkin hits much harder, overall he’s technically the better practitioner. Don’t get me wrong, there’s a small chance Golovkin has an off night and can be out hustled by Macklin’ over 12 rounds. But unfortunately for Matthew I don’t buy into this theory. I’m just looking forward to a good competitive fight, ultimately though it feels more like a showcase for one of Boxing’s rising power punchers. 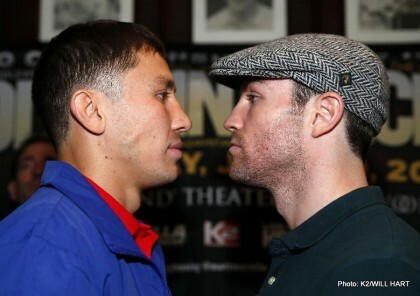 Next boxing news: Golovkin / Macklin: Will Matthew behave like a good boy?